A summary of the article “Compensatory growth renders Tcf7l1a dispensable for eye formation despite its requirement in eye field specification” Elife. 2019 Feb 19;8. pii: e40093. doi: 10.7554/eLife.40093. Zebrafish embryos are well suited to explore the link between genetic mutations (genotype) and developmental outcome (phenotype). In a paper recently published in eLife (elifesciences.org/articles/40093), we studied zebrafish carrying a mutation in a gene called tcf7l1a that encodes a protein functioning in the Wnt pathway, one of the most critical pathways by which cells signal to each other during development. The Wnt pathway is particularly important for development of the eyes. Zebrafish embryos with the tcf7l1a mutation initially have tiny forming eyes, but within a day or two, these eyes undergo compensatory growth to reach a size comparable to that in unaffected individuals. We found that the smaller eyes delayed the onset of differentiation, enabling them to continue growing until they reached the right size. How does the eye know what the right size is? We propose that there is a mechanism by which eye size is intrinsically assessed and this informs retinal cells when to stop dividing and start differentiating into neurons. This mechanism may also explain how it is that left and right eyes develop independently and yet still grow to the same size. Although compensatory growth could restore eye size when tcf7l1a function was absent, we speculated that developing eyes in these mutants may be very sensitive to the effect of additional genetic mutations. Indeed, we found additional interacting mutations that completely impaired eye development such that no eyes were formed, and others in which the developing eyes were unable to compensate their growth and remained small. These results contribute to a better understanding of the origin of developmental eye pathologies such as microphthalmia and anophthalmia, in which people are born with small eyes or no eyes at all. Read the digest of this paper on Elife https://elifesciences.org/digests/40093/eye-size-is-pre-programmed-in-zebrafish or treat yourself to the full text here https://elifesciences.org/articles/40093. Elife. 2019 Feb 19;8. pii: e40093. doi: 10.7554/eLife.40093. Nearly 40 years after US President Richard Nixon declared 'war on cancer', researchers around the world are still trying to understand how tumors form and grow. LMX1B is a gene that when mutated in humans causes Nail-Patella Syndrome (NPS), a condition with many different features including limb, joint and renal (kidney) defects and disrupted function of the central nervous system (brain and spinal cord) and eyes. Approximately 50% of patients develop elevated intraocular pressure and glaucoma. LMX1B encodes a LIM-homeodomain transcription factor - a protein that functions of a kind of genetic switch to regulate the activity of many other genes. Individuals can exhibit the condition if they lack function of just of their two copies of the gene (one from mother and one from father). Although the identity of the causative gene is known, how defective function of the gene leads to the wide range of abnormalities observed in patients is poorly understood. 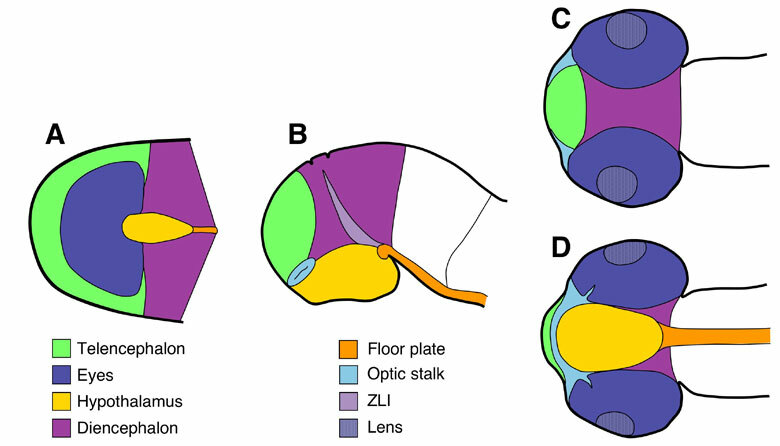 In this study, a collaboration with Brian Link, we studied the function of the zebrafish version of the LMX1B gene to elucidate how it might function during embryonic development of the eye. Figure 1: A. The lmx1b gene (in blue) is expressed in cells that surround the eye and in an open groove in the retina, the choroid fissure (indicated by the black line in B), that is present in the eye early in development. Eyes in embryos with compromised Lmx1b function exhibit varying degrees of coloboma (the condition where the choroid fissure doesn't properly close). The eyes form during embryogenesis as outgrowths from the developing brain - these outgrowths are called optic vesicles and they will give rise to the retina and the pigmented cells at the back of the eye (for more information, see our research pages on eye development www.ucl.ac.uk/zebrafish-group/research/eye.php). Other groups of cells contribute to other eye structures such as the lens, blood vessels and protective coat of the eyeball. How all of these different groups of cells interact in a highly coordinated way during eye formation is poorly understood. In this study, we show that the lmx1b gene is expressed in highly motile cells that migrate around the optic vesicles as they are forming (Figure 1A and Movies 1 and 2). To test the function of the gene in these cells, we removed its function using anti-sense reagents that prevent formation of Lmx1b protein. This resulted in the motile cells failing to properly migrate around the eye and indeed many of these cells subsequently died (Movie 2). This disruption to the migratory cells was correlated with a failure in the optic vesicle to under the tissue movements that enable the eye to take on its spherical shape. Indeed, we often observed that eye exhibited coloboma, a condition in which two lips of the forming eye fail to fuse together in the ventral (lower) part of the eye (Figure 1B-D). These results strongly suggest (but have not proven) that the migratory cells are required for the optic vesicle to form the spherical eye. If correct, how might this happen? We suspect that the migratory cells may secrete proteins that help the nascent eye cells to undergo tissue re-shaping but this will require further research to resolve. We also found that retinal cells are incorrectly patterned when Lmx1b function is disrupted - this would lead to defects in visual map formation when connections are made between the eye and the brain. We do not know if this problem is a consequence of the death of the motile cells around the eye or to some other action of the Lmx1b gene. Many of the deficits we describe in fish are more severe than observed in human patients - this is most likely due to the fact that our experiments deplete Lmx1b function more severely than in patients. If the function of the gene is severely compromised in humans, it would lead to early lethality as we observe in fish. Our studies in fish will continue to elucidate how genes function and cells and tissues interact during vertebrate eye formation and will help us to understand human diseases, conditions and syndromes in which these processes are disrupted. Branchio-oculo-facial syndrome is a severely debilitating congenital condition in which affected individuals exhibit various symptoms including cleft lip, malformed ears and nose, mental retardation and eye defects.